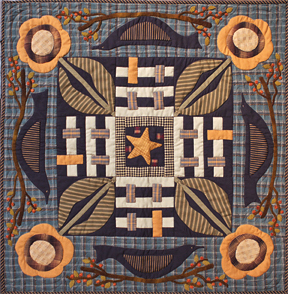 Finished size - 30" X 30"
Welcome autumn by displaying this table topper made with seasonal colors and motifs. Black birds perch on bittersweet branches underneath bright sunflowers just outside the striped houses. A combination of woven fabrics and felted wool are used to create this cheerful design.